Newly available dual-port NVMe SSD technology means that all-flash array deployments can now benefit from full high availability and NVMe performance. The servers are connected with a Non-Transparent Bridge (NTB), a PCIe Gen3x16 link, which the software-defined storage stack can use to synchronize metadata between the two compute canisters. 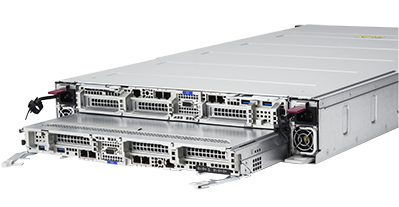 The Ultrastar Serv24-HA is built to deliver high availability and enterprise-class reliability. The entire enclosure, including server canisters, is backed with a 5-year limited warranty. 1One MB is equal to one million bytes, one GB is equal to one billion bytes and one TB equals 1,000GB (one trillion bytes) when referring to storage capacity. Accessible capacity will vary from the stated capacity due to formatting and partitioning of the drives, the operating system and other factors.